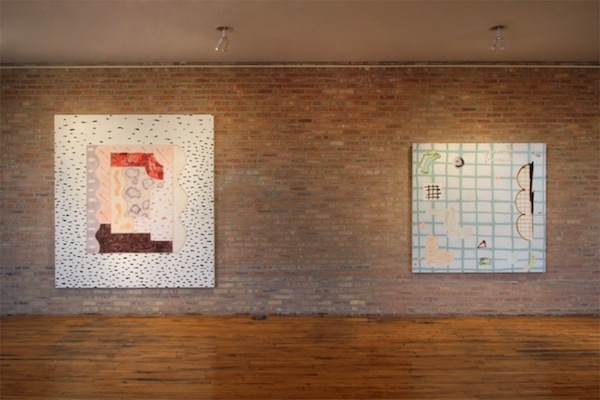 Left: Rebecca Morris, Untitled (#06-13), 2013, oil on canvas, 87 x 80”. Right: Rebecca Morris, Untitled (#09-13), 2013, oil and spray paint on canvas, 67 x 65”. Los Angeles–based artist Rebecca Morris is known for her paintings and sharp compositional wit. Here, she discusses her approach to abstraction and the impulses behind her upcoming solo exhibition, “Party Cut,” which is on view at Corbett vs. Dempsey in Chicago from September 6 through October 19. Morris’s work is also featured in a solo exhibition, “#18,” at Galerie Barbara Weiss, Berlin, until October 5, 2013. CHICAGO IS WHERE I BEGAN as an artist; I had my first solo exhibition at Ten In One Gallery in 1996. The title of my latest show, “Party Cut,” refers to a certain way pizza is cut into a grid so that there are more pieces per pie. I grew up in New Haven, Connecticut, which is famous for its pizza, and the party cut is pretty much an abomination for a real pizza lover like myself. It means that with some slices you’ll never get a piece of the crust, as opposed to when it’s in triangular cuts, which guarantees you’ll always get the full spectrum of the pizza. Back in 2005 at the Renaissance Society, one of the curators at my third solo show in Chicago looked at a painting of mine—a construction of shards interpieced together—and mentioned that it looked like a pizza sliced into “crazy cuts.” It’s a comment that for whatever reason has been stuck in my mind ever since. The way of dividing out a painting has a lot to do with how one cuts up its entire surface; the grid is something I’ve been using in a more foregrounded way at the moment, but it’s an aspect of my work that’s always been there. The grid is a linear, somewhat analytic structure that nongeometric elements can be anchored against—a great way of breaking up the otherwise normative picture plane, while providing a grounding for improvisational elements that affirms their relevance. When I reflect on the term abstraction, I think of it as something that isn’t literal and can’t be looked at to know what it is immediately. There are various levels to this: In my own work, I am noticing that the abstractions are looking more like things, though they aren’t representational exactly. There’s a shape or mark—like this dashy gesture I’ve been employing right now—that will be new to me when I first use it. As the work progresses, I will sometimes see it pop up a few more times. It then becomes recognizable to me as a type of reappearing language and I become curious to see where it is going to go. The mark won’t necessarily mean the same thing every time; it instead continually shifts. The process of painting involves a sense of what one wants in their internal world and how they come about putting whatever that is out there. I can have a sense of what I want, but it’s never overtly crystallized when it’s still in my head. Once it emerges, I give myself plenty of room to accept how it may be different than what I had initially thought I wanted. I don’t like planning too much in advance, because I want to be fully open to that moment—to that transition from the inside to its manifestation in the outside world. The trick is to keep a real fluidity within the practice. The title of this show seems to have that embedded within it too, the “cuts” belonging to songs one might play when throwing a party. All of this—the pizza, grids, and music—captures what I think is the essence of the works in this exhibition. It is this feeling of joy that is the most important part for me in painting. I don’t know how to put that into a neat, little paragraph, but that’s where “Party Cut” comes from.